Mitsubishi Aircraft (MITAC) has modified the first Mitsubishi Regional Jet (MRJ) 90 since its initial three flights last November and was due to have re-flown the machine ahead of this week’s airshow. It’s Japan’s first domestically developed passenger airliner since the NAMC YS-11 regional turboprop more than 50 years ago. Taxying tests with the updated aircraft scheduled for “early February” were planned to follow functional tests performed during January. Meanwhile, the MRJ90’s entry into service has been postponed for a further year to the second quarter of 2018–the program’s fourth delay–even as launch customer All Nippon Airways (ANA) has conducted its first acceptance inspection of the initial delivery aircraft. MITAC (Stand U01) flew the first flight-test aircraft (FTA-1) three times in November before withdrawing the machine from operation to incorporate planned structural and systems changes. The manufacturer has confirmed the design’s “basic characteristics and functionality.” Analysis of the flights, including operation of landing gear and flaps (but not reverse thrust), verified performance “according to specifications” and complemented feedback from ground and taxi tests. In late January, Mitsubishi revealed details of planned airframe strengthening modifications after having analyzed static test results last year that indicated a weakness in the airframe and wing attachment. “Some components that join the wing and the fuselage, as well as those of the fuselage frame, would have insufficient strength [during ultimate load tests],” according to the manufacturer. As a result, additional “plates” have been introduced to reinforce original parts. Mitsubishi had deemed that modification unnecessary ahead of first flight, for which the Japanese Civil Aviation Board issued a special permit in October. “But we decided to implement the upgrades during this round of feedback upgrades,” said MITAC. Type certification requires the airframe to withstand a load 50 percent greater than the limit load (the highest expected to be experienced in operation). Other changes comprise software upgrades to avionics, and engine- and flight-control systems, with the modifications also being applied to the second MRJ (FTA-2). Functional testing of third aircraft (FTA-3) began in January, as MITAC installed final systems parts and cabin interiors on FTA-4 and FTA-5, which were in final assembly. All four remaining flight-test MRJ90s are slated to fly during 2016, as trials continue on two further airframes constructed for static- and fatigue-strength tests. Mitsubishi has completed assembling major structures for the latter test specimen, which by late January was standing on its own landing gear and measuring instruments were being installed. In revising the MRJ initial delivery schedule, MITAC and parent Mitsubishi Heavy Industries (MHI) have extended the time available for flight trials in both Japan and the U.S., and testing now may continue into early 2018. The two years previously allotted by the two companies for flight testing, certification, and entry into service has now grown to at least 30 months. The October taxi trials saw MITAC test braking (including emergency stop and rejected take-off), nosewheel steering, and expanding the speed range up to 120 knots. The MRJ’s three flights, at Tokyo’s Nagoya Airport between November 11 and 27, covered take-off and landing performance, ascent (to 15,000 feet) and descent, cruise (up to 200 knots), and turns, as well as landing-gear and flap operation (0-30 degrees). Confirming the latest delivery-schedule revision in late December, MHI and MITAC acknowledged that the review reflected additions to (and revisions of) original test items, as well as Mitsubishi’s joint engineering work with U.S. partners aimed at ensuring a “better-integrated” aircraft. This has resulted in a new MRJ development structure intended to ensure “prompt execution” of all activities, with roles and responsibilities assigned among three engineering bases in the two countries. This fourth MRJ delay, which follows discussions with U.S. partner Aerospace Testing Engineering & Certification (AeroTEC), will permit much more time for testing, both on the ground and in the air. AeroTEC’s Moses Lake Test Center at Grant County International Airport (Washington state) is the site for American flight tests and support, including data analysis and report writing. AeroTEC provides data analysis, FAA certification and flight-testing services to manufacturers like Honeywell and Lockheed Martin and aircraft modification companies such as Aviation Partners Boeing and Raisbeck Engineering. After consulting AeroTEC, Mitsubishi has taken a more realistic approach to scheduling the MRJ flight-test program. 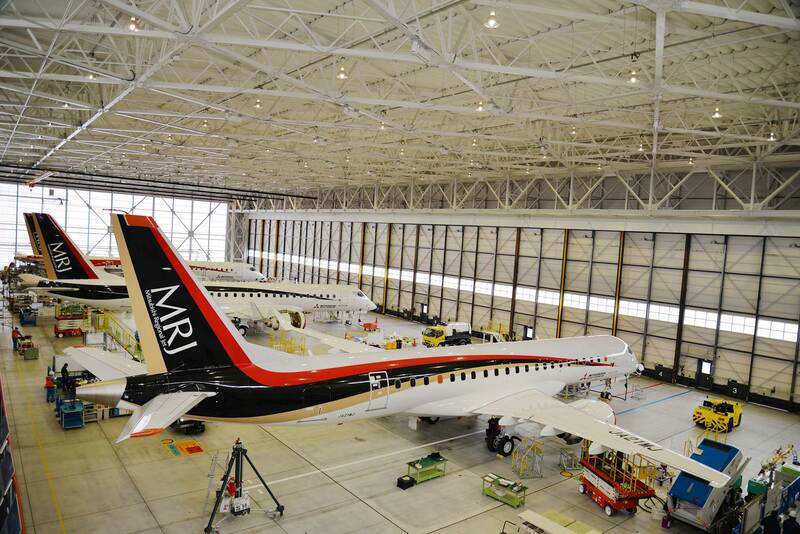 Discussions had stimulated caution last year as the manufacturer approached the MRJ’s flight readiness, with more time being devoted to checking each step. A thorough review identified a number of different items that were added to pre-flight-test work. Kishi has also admitted that further work is required on the aircraft and in reaching agreement with suppliers. He says that MRJ’s landing gear and wheels need to be “redesigned for better safety,” while he is also talking with engine manufacturer Pratt & Whitney about a revised schedule for supplying the aircraft’s PW1200G-JM geared-turbofans. In December, MITAC and Boeing unveiled their joint development of the My MRJ Fleet.com (MMF) customer-support service web portal. Construction also has began at MHI’s Kobe Shipyard & Machinery Works for a new factory to build MRJ wings. Main wing skins/spars and the center wing will be manufactured under an integrated system in the 5,600-sq-m new factory and an adjacent 25,400-sq-m plant. ANA’s mid-January acceptance inspection and approval covered the first-delivery MRJ’s “wing framework assembly” at MHI’s Nagoya Aerospace Systems plant at Tobishima. Such on-site customer inspections are set at several points within MITAC’s manufacturing process, and include the structural state of fuselage, tail assembly, wing, and other components, as well as component integration, and system parts’ installation. Final ground and in-flight inspections will precede delivery, says MITAC.